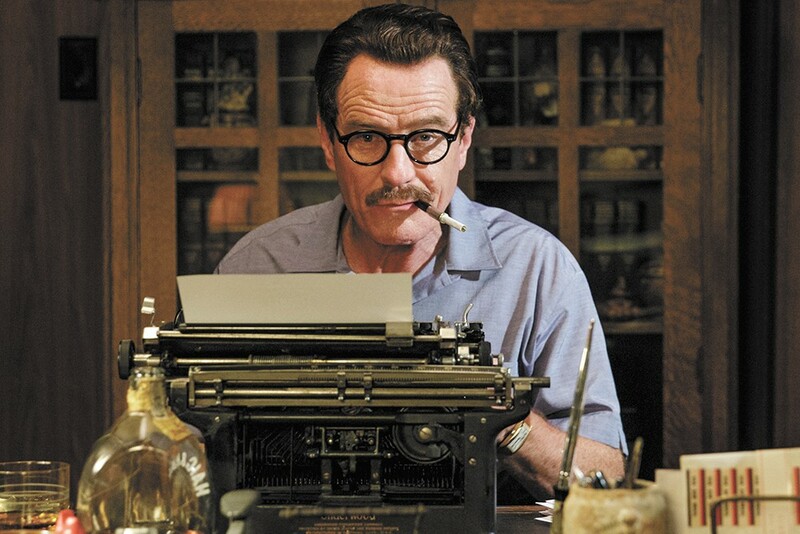 Bryan Cranston as blacklisted screenwriter Dalton Trumbo. Nobody ever confused the 1997 Bond spoof Austin Powers: International Man of Mystery with a historically accurate portrayal of the swinging '60s. And yet, in his first feature film — that groovy-baby, tsunamic success — director Jay Roach did catch some of the flavor, the randy fever, of the times: Call it history-adjacent. Disappointingly, the same modifier must apply to the more sober-minded Trumbo, Roach's too-twee and terribly theatrical rendering of the battle that blacklisted screenwriter Dalton Trumbo (Bryan Cranston) fought and — if you take the long view — finally won. A celebrated screenwriter (Kitty Foyle, Thirty Seconds Over Tokyo) and novelist (Johnny Got His Gun) when the Red Scare machine revved up, Trumbo was one of the more prominent Hollywood players to be called to appear before the House Un-American Activities Committee in 1947 to discuss his perfectly legal involvement in the Communist Party. Trumbo declined to cooperate, along with other subpoenaed writers and directors; that first wave of unfriendly witnesses became immortalized as the Hollywood Ten, blacklisted from future work in Hollywood. Trumbo, like so many others, was forced to write under pseudonyms (rightfully owed the Oscar for Roman Holiday, Trumbo was posthumously recognized), and he had a steady gig with the low-rent King brothers (John Goodman and Stephen Root), dirty-worded bright spots in a film that hoards the best quips for Cranston. Trumbo dutifully clops through what came before and after the HUAC hearings (though curiously skipping over the writer's self-imposed exile in Mexico with his family) and namechecks famous people with the frequency of a celebrity mag. Helen Mirren, as the toady gossip columnist Hedda Hopper, benefits from playing someone no longer emblazoned in filmgoers' brain banks, while the exceptional character actor Michael Stuhlbarg, miscast, paws the ground fruitlessly trying to make inroads on the more iconic Edward G. Robinson. Trumbo surely does a public service by reminding folks John Wayne was kind of a jerk, and Ronald Reagan a friendly witness (yep, the jellybean king was a rat), but that good deed is undone by the film's ironic decision to composite several Hollywood Ten writers into a single made-up guy (played by Louis C.K. — not his fault). In a movie explicitly about men stripped of their names, it seems exceptionally bad form to do the same in service of narrative expediency. Trumbo is not showing in any theaters in the area.